It's hard to make much progress on any given project without a little blood, sweat, and tears to go along with all of the work. In our quick office makeover, we officially have all three. I'm convinced that one of the primary reasons we started this project was due to Wendy's...how should I put this... strong aversion to the carpet that has adorned the floor of this room since we purchased the house. Keep in mind, this wasn't so much an immediate aversion, but instead grew over time, like a giant stained and smelly feature of our home. This is the only carpeted room in the whole house, and the carpet was likely installed 20 or so years ago. 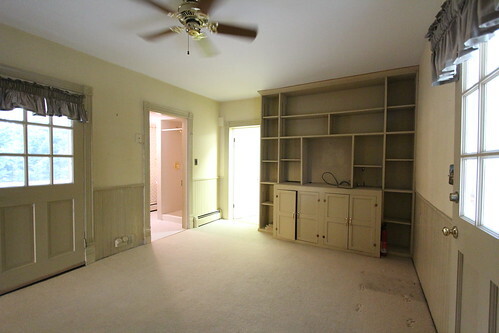 Here's how it looked on the day we moved in, and it was the best it looked since we bought the house. Sure it was a little worn and a little dirty in spots, but initially it was passable. 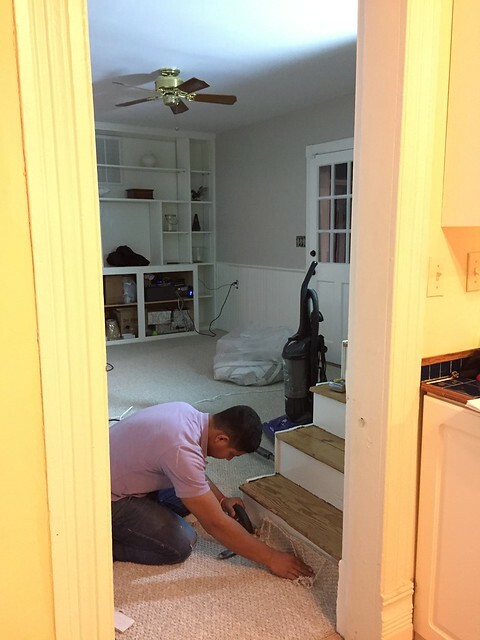 We knew we'd eventually (many years from now) pull up the carpet and the sub floor under the rug to expose the original pine floors that I believe are in good shape, but we figured until that day, that carpet would be fine. The only struggle in this plan is the fact that Wendy is what I like to call a "compulsive vacuumer." Wendy will vacuum a rug several times a week if she feels it may be dirty, and this carpet seemed to always look a little dirty. But we'd resolved to make do with what we had as other areas of the house seemed more pressing. And even though we always noticed a distinctive smell when we arrived at the house, Wendy and I just chalked it up to "old house smell" and something that was just part of the home. 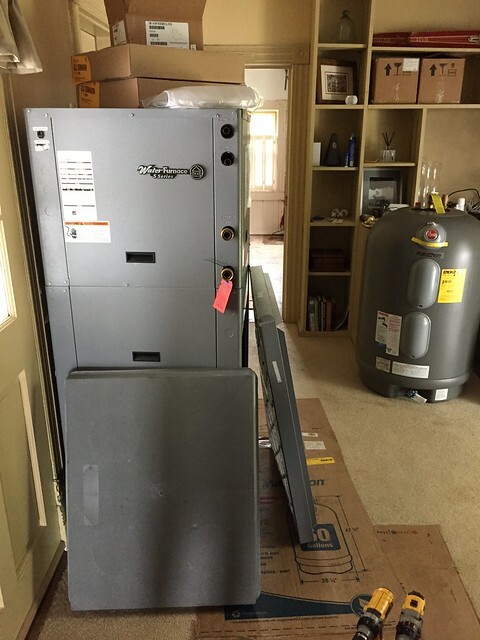 Then our heat went out, our house froze, and we replaced all of the HVAC. When that happened the baseboard radiators leaked all over the carpet and padding, then the HVAC company used this room as a staging ground for the new equipment going into the utility room. The activity and constant traffic left plenty of mud and dirt stains in various places in the middle of this room. Also related to the HVAC work, once we removed the baseboard radiators we were left with gaps between the carpet and the wall around nearly the entire room, and little square cutouts where the copper pipes had run through the floor. This is where the tears of our project were introduced, shed due to the rapid decline this room's carpet seemed to be experiencing. I hope I'm doing an adequate job painting a picture of the shape the room and carpeting were in. 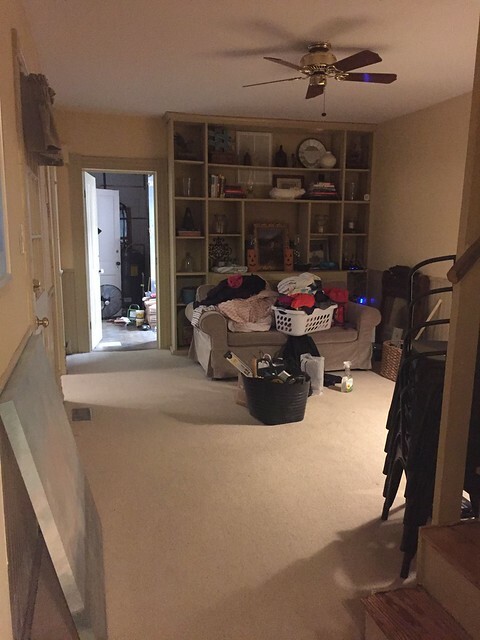 The photo above may be the best possible representation of how this room was commonly used -- it was a mess and a dumping ground for miscellaneous stuff. I just wish it was a scratch-n-sniff photo. 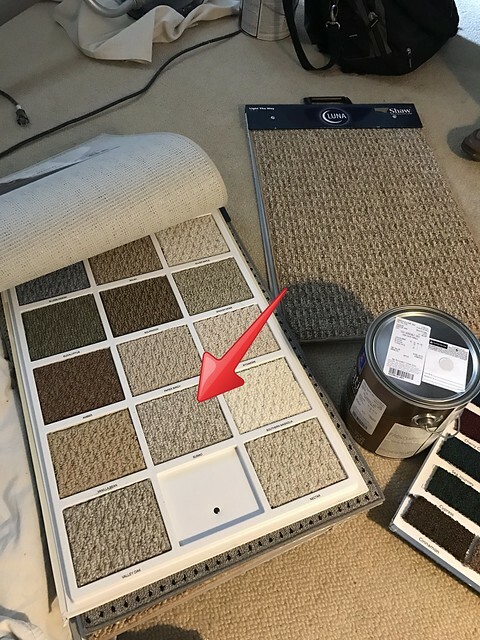 As we started painting the room it became immediately apparent that the carpet would be the thing that detracted from an otherwise nice room makeover. 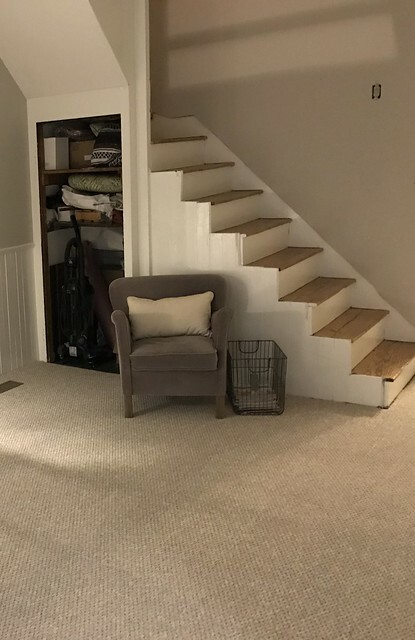 Therefore, we (and by that, I mean "I") resigned ourselves to either exposing the original flooring or replacing the carpet and padding with something new. 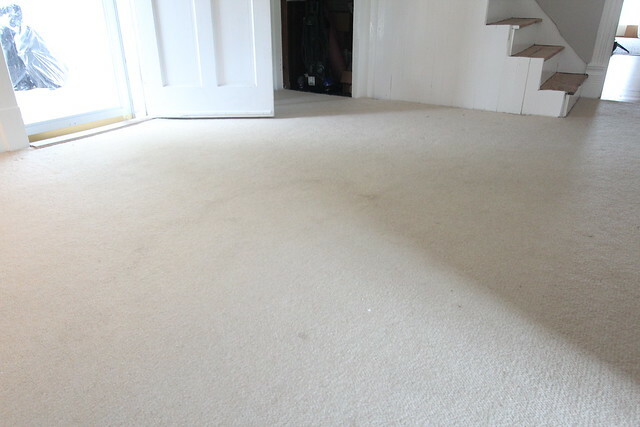 As you can see from the next photo, the large yet subtle stains in the middle of the carpet were not going to be corrected anytime soon. Wendy made a few calls to carpet installers and one day, while we were still painting the room, they came out and showed us their sample boards. We talked with two installers about many different options including commercial grade, washable, berber, etc. As a couple of people who have never purchased carpet, it was a bit of a learning experience. 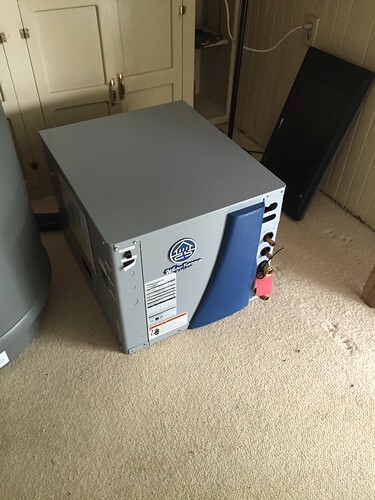 The thing that surprised me is that in a room this small, you might be able to get a major price break because you can use remnants. With the first vendor, the selection was tiny but the price was low because the owner was also the sales person and dealing with his own stock. In the other case the sales guy looked up inventory that other people have that match our needs, then he called that person and negotiated his price with him, almost like he was a carpet match making service. This meant a much larger selection, but slightly higher prices. By the end of the day we had settled on a nice mid-grade grey carpet with a little beige to it (no, I'm not using that terrible word and acting like grey and beige have some sort of celebrity romance). We'll go ahead and call it the name it was given, Sumac. We scheduled our install for one week later. This was in the middle of our painting project in the room, so we had a lot to get accomplished before the installers came out. 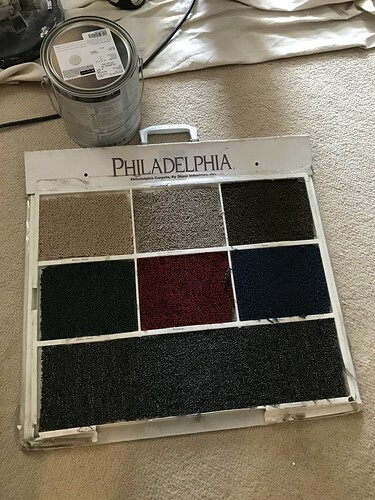 When we talked to the salesperson about new paint he told us that we'd be in good shape as long as the paint had about 72 hours to cure before the guys came to install the carpet. 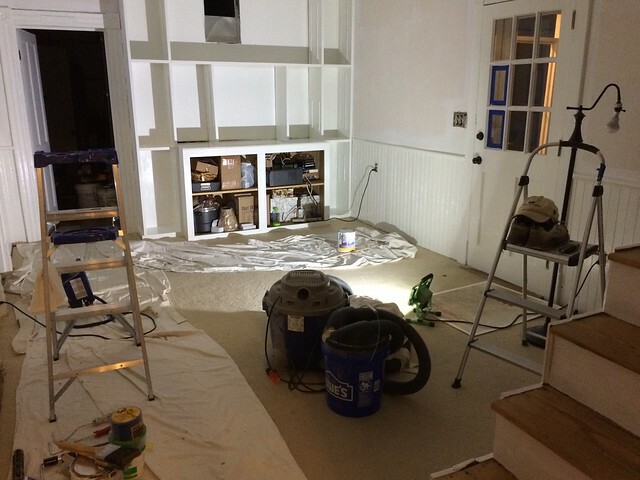 But that meant we (along with all of the painting help from Wendy's parents) had a whole lot to get accomplished in a very short timeline. This is where the sweat of the project came into play. As soon as we settled on the carpet and handed over the deposit, I saw a calm roll over Wendy's face. She no longer felt saddled by this dirty wall-to-wall carpeting that she simply couldn't get clean. There was no longer the looming need to constantly vacuum the broadloom that had been laid out on our floor. She was free from this internal struggle and we all began using this large dingy mess of woven material as our collective painting drop cloth. It was beyond liberating. 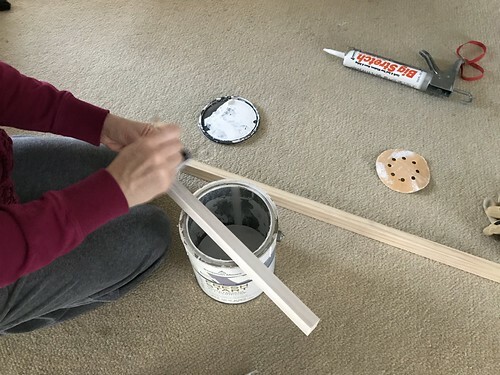 By the time the day rolled around that the installers were set to arrive we had the room almost fully painted and were eagerly awaiting their arrival. We expected them mid-day, which then turned into late afternoon, and eventually into the last planned stop of the day. Unfortunately, this meant that the installers would likely be rushed trying to finish out their day, and it also meant that they'd be arriving as the sun was setting, making it difficult to see the finished result in this room with very few lights. I set a few work lights in the room in an attempt to give the installers at least a little light while they were pulling out the old carpeting and padding and installing the new, but it was a losing battle. I let them do their thing while I checked in on their progress periodically. I was excited to see the flooring under the carpet after they pulled it all up, and was shocked to see it was blue painted plywood. It would seem that at some point this room may have just been covered in plywood with a blue floor. How weird is that? If it wasn't that, why would someone have taken the time to paint all of the plywood in the room blue? It just seems odd. 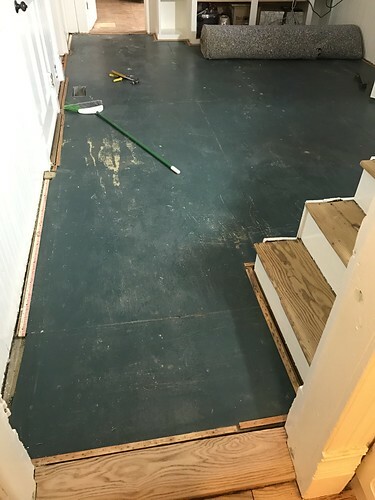 It also made us question the condition of the floors beneath the plywood, and reinforced we made a good decision by putting that restoration project off until another time. 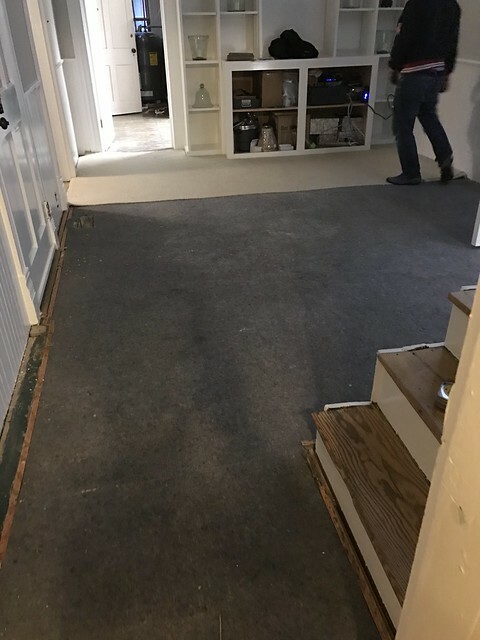 The number of stains on the underside of the rug (likely old pet stains) and the amount of dirt that came out of the removal of the old carpet and padding was also confirmation that we'd done the right thing in getting rid of that old mess. And these guys were working fast! 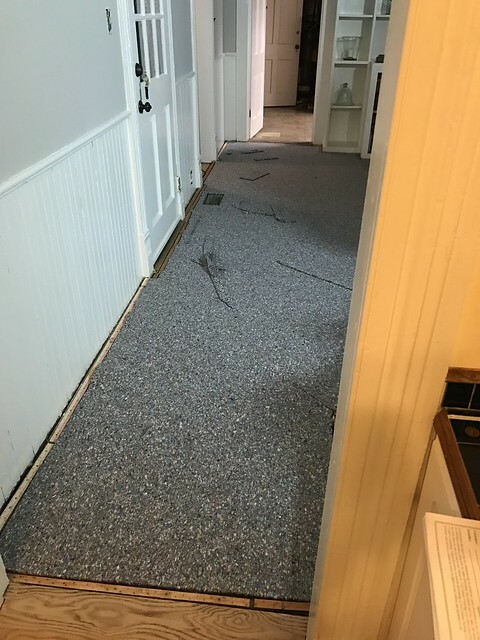 They came into the house, pulled out the old carpet and padding, pulled out the old tack strips, installed new tack strips, new padding, and stretched the new carpet all in about an hour and a half. This would have easily taken me 1-2 years to complete. No, not a typo. After they finished up we signed their paperwork, thanked them, and then they were on their way. Wendy and I were thrilled with the results in the dim light and were more than hopeful it would look good under the natural sunlight the next day. Then it happened. If you've been keeping track we had ourselves a few tears shed over the state of the old room, some sweat from the amount of work we'd been doing to get the room into shape, we were just missing a little blood to round out the old saying. Well, it was missing until I walked out on the porch to throw something out. I looked down at the floor and noticed something a little bit odd. It looked like someone had dropped some red paint on the porch floor just outside of our door. As I looked closer I realized that the little drop of red was actually dozens of drops of various sizes that seemed to be splattered around the porch. I started wondering what had happened and kept looking around the porch. It seemed everywhere I looked there was more blood. It was smeared, there were big drops and little drops, and a lot just off of the porch on the flower beds. Something bad had obviously happened, and I felt like I was watching an episode of Dexter. I told Wendy that we had an situation on our hands. The installers had already left and were long gone. I didn't want to call the carpet company right away as I wanted to get this clean before it dried, so we just started to clean it up. Then I realized that the two trash bags in the photo above were previously on the right side of the porch. 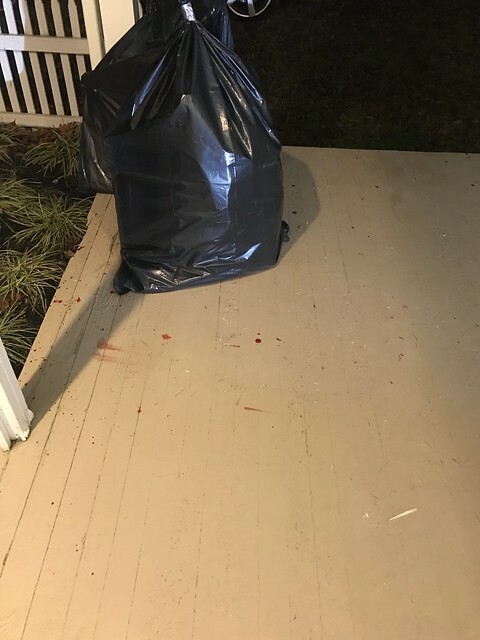 Whoever happened to be the individual that was borderline bleeding out on our side porch had apparently walked outside, noticed they were getting blood on the floor while probably applying their tourniquet, and bled all over the place. Likely concerned that we would notice the blood, they created a clever disguise for the blood by making it disappear under our garbage bag. Unfortunately, I foiled their plan when I moved the bag and saw blood all over and under the bag. I'm not entirely sure of the logic here, perhaps they were hoping we'd either not notice the red all over the place or just assume we'd been the ones bleeding? Full disclosure here, I did sort of freak out a little bit when I moved the bag and saw a lot more blood. For an instant I had the thought in my head of "OMG, is this black garbage bag full of blood and now there's a hole in in? WTF is going on? Is this like some horror film plot?!?!" I calmed myself and resumed cleaning. As I was outside on the porch scrubbing down the decking, I was trying to figure out what happened. My best guess is that the second installer had either cut himself on one of the tack strips as they were hauling things out of the house, or he had a pretty terrible bloody nose as they were finishing up the install. Either way, I think he took a little while to tend to the cut and ended up spending a fair amount of time just watching himself bleed. I keep waffling between the thought of "poor guy bleeding all over the place," and "who bleeds all over the place and then puts a garbage bag on top of it? I mean, who does that?!" After I felt satisfied that he was probably okay (given that they both walked to their truck and left without mentioning anything), my thought process then swung over to panic once again. 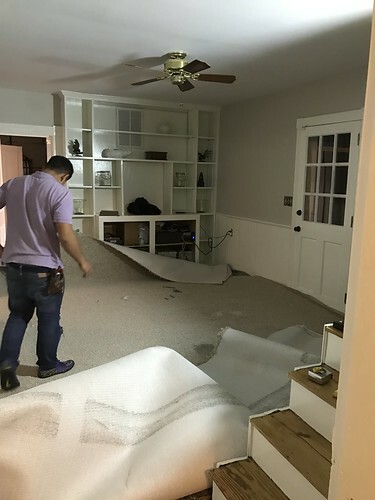 "Oh my, our carpet installer was bleeding all over the place, and he was just installing our new carpet...did this get all over our new carpet?" Wendy and I started closely inspecting and feel pretty fortunate that we only found three small blood spots inside, especially given how much was on the porch. 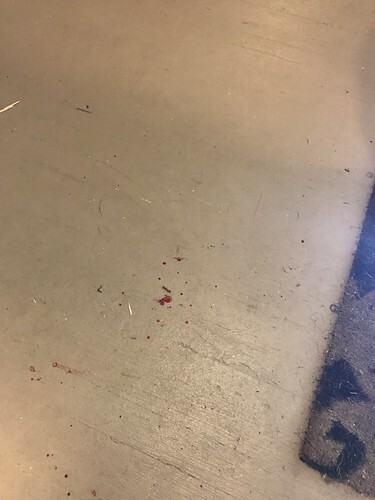 So the bad news is that our brand new carpet already had blood on it. The good news is that our carpet is apparently pretty awesome at not allowing stains to set and generally being washable, because we were able to spot clean the blood without issue. After spending about an hour cleaning blood up from new spots we kept finding (it seemed like everywhere we turned there was more outside, and blood is apparently hard to clean), we were confident we got it all cleaned up. At this point our attention turned to our new carpet which was when we discovered another not so great surprise. There are a couple areas that appear to have defects. Not having lived with berber before, we're not sure how to fix it without creating a bigger issue. 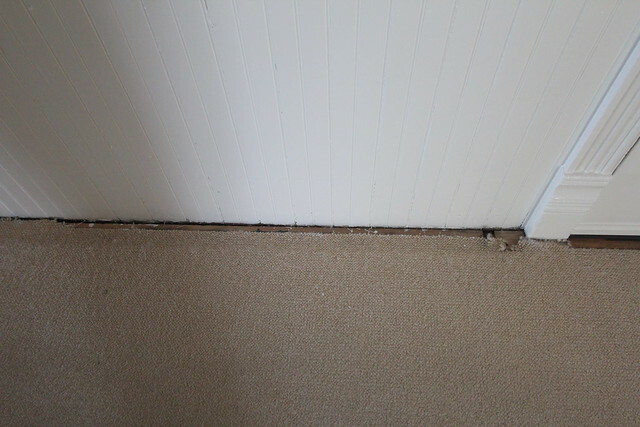 If we trim it off, will the carpet then get a huge horizontal run? Wendy decided to give customer service a call to figure out if the pulls would be a problem. We also decided to ignore the fact that there could possibly be more blood beneath the carpet on the padding (probably unlikely, right?). So in spite of the fact we have a this pull issue to work out with the company's customer service department, Wendy couldn't help herself and had to start loading in a few pieces of furniture just to see how it all looked. It was so dark outside, but it was still so exciting. The new padding was squishy under foot, and this carpet actually went wall-to-wall (not 2 inches short of wall to wall). And the best news of all, that distinctive smell that we always chalked up to "old house" seemed to be gone. 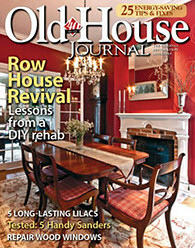 I guess it wasn't as much "old house" as it was "old stained carpet." As a few DIY veterans that have rarely experienced the instant gratification of hiring out work, this all felt a little bit like magic. The next morning we woke up and raced downstairs like it was Christmas morning. We wanted to see this new carpet in all of its morning light glory. I can tell you, Wendy was nearly euphoric. I think the first thing she did was grab our vacuum and give it a once over. Her compulsive vacuuming had transformed overnight from a grueling task with no possible positive outcome to one that she would enjoy obsessing about. Now that we've been back in the house since the carpet was installed, we can say that the particular smell we'd associated with the house is no more. 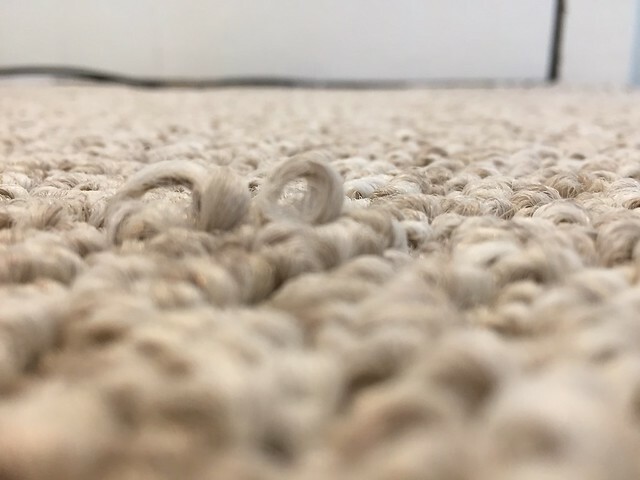 The company has also given us a $100 credit back (roughly 20% of the cost of the carpet and installation) to put towards professional cleaning of the rug and the inconvenience, and they're sending a representative out in a few weeks to inspect the pulls to see what can be done. I'd say this is a pretty great customer service response to the situation. Before we can ultimately claim victory over our small office, we still have a handful of items left to paint, furniture and accessories to load in, a handrail and newel post to build, and a major decision about a fan vs. light fixture. Nothing a few weekends of work can't knock out. No matter what, when we arrive now we can breath in the fresh smelling air of our house instead of old carpet funk, and this room is one huge step closer to being a space we can be proud of. That carpet looks perfect in the room from what little I can see (so we aren't getting a fuller view?;). 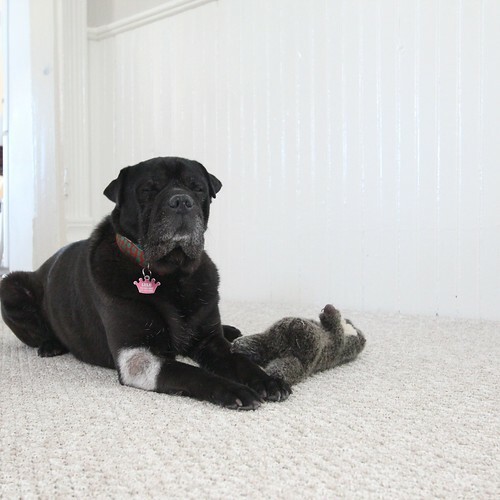 Major kudos to Wendy for tolerating that old, smelly carpet for so long. This refresh is similar to the new rug in the OTH den: a few "quick" changes puts new life in the space. So excited for you guys with this progress. And how great are those superhero parents!! Thanks so much, SH! We'll include a fuller shot of the new carpet in the next post when we tackle the handrail. Unfortunately the majority of the photos I took were blurry (total user error) so we didn't have much to pull from. And yes, seriously. My parents rock. We would never have attempted to start this project without their help, and this is already my new favorite room in the house! Looks much better! 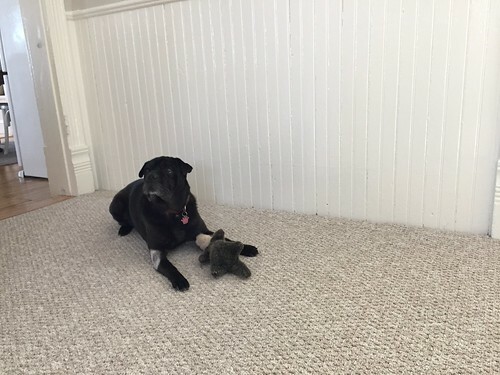 I have two dogs and (accidentally) bought a hooked rug. Bad idea, their nails snagged all over it. Not sure if berber is the same? If so, don't use a vacuuum with a beater bar on it, it'll only frizz out the loops. although now that I think of it, berber is great for "shore" homes, every vacation home I've been in at the beach has had berber. must be good at hiding sand! Great tip on the beater bar! I noticed that some of the other area rugs in the house look a little worse for the wear because of the vacuuming. We just bought a new attachment and I'll definitely be using this going forward. Whew! I was worried this wasn't going to have a happy ending but am glad to see that it did! Great to hear from you Barb! Yes, it was touch and go there for a bit but we're looking past some of the "issues" and are focusing on how much better the room looks and smells. Looks great! I'm sure it's a big relief, especially with the smell gone. I had no idea. So greige is not only another violator of the I before E except after C rule, but it's more a description of color due to material state rather than description of actual color. That's very cool and interesting. I think we can adopt it to also mean a state of mind. "I just woke up feeling a bit greige today, I think I need a little color in my life."